Erb's palsy or Erb–Duchenne palsy is a form of obstetric brachial plexus palsy. It occurs when there's an injury to the brachial plexus , specifically the upper brachial plexus at birth. The injury can either stretch, rupture or avulse the roots of the plexus from the spinal cord. It is the most common birth related neuropraxia (about 48%). It is a lesion of C5 & C6 nerve roots (in some cases C7 is involved as well) usually produced by widening of the head shoulder interval. Injuries to the brachial plexus affects movement and cutaneous sensations in the upper limb. Depending on the severity of the injury, the paralysis can either resolve on its own over a period of months, require rehabilitative therapy or surgery. Neurologically, the Erb's point is a site at the upper trunk of the Brachial Plexus located 2-3cm above the clavicle. It's formed by the union of the C5 and C6 roots which later converge. Affected nerves in Erb's palsy are the axillary nerve, musculocutaneous, & suprascapular nerve. posteriorly passing through the quadrangular space with posterior circumflex humeral artery. it fives rise to superior lateral brachial cutaneous nerve then winds around the surgical neck of the humerus deep to deltoid. It innervates the shoulder joint, teres minor and deltoid muscles, skin of superolateral arm. Musculocutaneous nerve- originates from the terminal branch of lateral cord receiving fibers from C5-C7. It exits the axilla by piercing coracobrachialis, descends between biceps brachii and brachialis while supplying both, continues as lateral cutaneous nerve of forearm. It innervates the muscles of the anterior compartment of the arm and the skin of lateral aspect of the forearm. 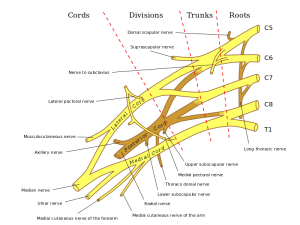 Suprascapular nerve- originates from the superior trunk receiving fibers from C5, C6 often C4. It passes laterally across lateral cervical region superior to brachial plexus then through scapular notch inferior to superior transverse scapular ligament. It innervates the supraspinatus, infraspinatus and shoulder joint. An incidence of 0.8-1 per 1,000 births has been reported for brachial plexus birth palsy (BPBP) in the US. Erb's palsy accounts for about 45% of BPBP. Additional injury to C7 is commonly discovered in 20% of cases of BPBP. Incidence of permanent impairment is 3-25%. The rate of recovery in the first few weeks is a good indicator of final outcome. Complete recovery is unlikely if no improvement has occurred in the first two weeks of life. A study by Weizsaeker et al 2007 found that being a member of the black population was independently predictive for Erb's palsy. The most common cause of Erb's palsy is excessive lateral traction or stretching of the baby's head and neck in opposite directions during delivery usually associated with shoulder dystocia. This may happen during delivery of the head, the head may be deviated away from the axial plane. There can also be compression of the brachial plexus causing it to stretch and tear. Sometimes, pulling on the infant's shoulder during delivery or excessive pressure on the baby's raised arm during a breech delivery can cause brachial plexus injury. Two potential forces act on the brachial plexus during labor- natural expulsive force of the uterus, traction force applied by the obstetrician. The classical sign of erb's palsy is called Waiter's tip deformity. This is due to loss of the lateral rotators of the shoulder, arm flexors, and hand extensor muscles. The position of the limb, under such conditions, is characterized by : the arm hanging by the side and is rotated medially, the forearm extended and pronated and the wrist flexed. Also,there is loss of sensation in the lateral aspect of the forearm. A thorough history and physical examination with focus on neurologic examination are used to confirm diagnosis. History- aims to gather information about pregnancy complicated either by gestational diabetes or maternal obesity, fetal macrosomia, prolonged second stage labour, shoulder dystocia, use of assitive techniques-forceps to aid delivery. Physical examination- most often shows decreased or absent movement of the affected arm. Neurologic examination- assesses muscle power, sensation,reflexes- moro reflex is absent on the affected arm. It might also be important to look for presence of cervical rib. In the report by Becker J, et al (2002), the authors noted that in a series of 42 infants found to have a cervical rib, 28 newborns had an Erb's palsy. They concluded that a cervical rib was a risk factor for an Erb's palsy. Some brachial plexus injuries may heal without treatment. Many children who are injured during birth improve or recover by 3 to 4 months of age, although it may take up to two years to recover. Fortunately, between 80% to 90% of children with such injuries will attain normal or near normal function. Treatment for brachial plexus injuries includes physiotherapy and, in some cases, surgery. During the first 6 months treatment is directed specifically at prevention of fixed deformities. Exercise therapy should be administered daily to maintain ROM and improve muscle strength. Parents must be taught to take an active role in maintaining ROM and keeping the functioning muscles fit. Exercises should include bimanual or bilateral motor planning activities. Indications for surgery is no clinical or EMG evidence of biceps function by 6 months. This represents 10% to 20% of children with obstetric palsies. The three most common treatments for Erb's Palsy are: Nerve transplants (usually from the opposite leg), Sub Scapularis releases and Latissimus Dorsi Tendon Transfers. Nerve transplants are usually performed on babies under the age of 9 months since the fast development of younger babies increases the effectiveness of the procedure. They are not usually carried out on patients older than this because when the procedure is done on older infants, more harm than good is done and can result in nerve damage in the area where the nerves were taken from. Scarring can vary from faint scars along the lines of the neck to full "T" shapes across the whole shoulder depending on the training of the surgeon and the nature of the transplant. Subscapularis releases, however, are not time limited. Since it is merely cutting a "Z" shape into the subscapularis muscle to provide stretch within the arm, it can be carried out at almost any age and can be carried out repeatedly on the same arm; however, this will compromise the integrity of the muscle. Latissimus Dorsi Tendon Transfers involve cutting the Latissimus Dorsi in half horizontally in order to 'pull' part of the muscle around and attach it to the outside of the biceps. This procedure provides external rotation with varying degrees of success. A side effect may be increased sensitivity of the part of the biceps where the muscle will now lie, since the Latissimus Dorsi has roughly twice the number of nerve endings per square inch of other muscles. The prognosis is dependent on the severity of injury, timing of treatment- the earlier, the better the results and associated injuries (fractures of shoulder/arm). Mild cases of erb's palsy may resolve in three to six months with physical therapy. Erb's palsy resolves completely in the first year of life in approximately 70%- 80% of patients and nearly 100% if treatment begins in the first four weeks of birth. Also, effective hand grasp during treatment is associated with good prognosis. ↑ Gilbert WM, Nesbitt TS, Danielsen B. Associated factors in 1611 cases of brachial plexus injurt. Obstet Gynecol.1999 Apr. 93(4): 536-40. ↑ 3.0 3.1 Smith NC, Rowan P, Benson LJ, et al. Neonatal brachial plexus palsy: outcome of absent biceps function at three months of age. J Bone Joint Surg Am. 2004;86-A:2163-2170. ↑ 4.0 4.1 4.2 Weizsaeker K, Deaver JE, Cohen WR; Labour characteristics and neonatal Erb's palsy.BJOG.2007 Aug 114(8):1003-9. Epub 2007 Jun 12. ↑ Becker MH, Lassner F, Bahm J, Ingianni G, Pallua N.. The cervical rib. A predisposing factor for obstetric brachial plexus lesions. J Bone Joint Surg Br. 2002 Jul;84(5):740-3. ↑ 8.0 8.1 Medina LS, Yaylali I, Zurakowski D, et al. Diagnostic performance of MRI and MR myelography in infants with a brachial plexus injury. Pediat Radiol. 2006;36:1295-1299. ↑ 9.0 9.1 Smith AB, Gupta N, Strober J, et al Magnetiic resonance neurography in children with birth-related brachial plexus injury. Pediatr Radiol. 2008;38:159-163. ↑ 10.0 10.1 Tse R, Nixon JN, Iyer RS, et al.The diagnostic value of CT myelography MR myelography and both in neonatal brachial plexus palsy. AJNR Am J Neuroradiol. 2014;35:1425-1432. ↑ Vaz DV, Mancini MC, do Amaral MF, de Brito Brandão M, de França Drummond A, da Fonseca ST. Clinical changes during an intervention based on constraint-induced movement therapy principles on use of the affected arm of a child with obstetric brachial plexus injury: a case report. Occup Ther Int. 2010 Dec;17(4):159-67. ↑ Peleg D, Hasnin J,Shalev E. Fractured clavicle and Erb's palsy unrelated to birth trauma. Am J Obste Gynaecol. 1997,177:1038-40. ↑ Gabriel SR, ThometzJG, Jaradeh S. Septic arthritis associated with brachial plexus neuropathy. A case report. J Bone Joint Surg Am.1996;78:103-5. ↑ Sharma RR, Sethu AU, Mahapatra AK, Pawar SJ, Nath A. Neonatal cervical osteomyelitis with paraspinal abscess and Erb's palsy. A case report and brief review of the literature. Pediatr Neurosurg.2000;32:230-3.